Draining your pool is a time-consuming, costly and potentially difficult procedure that is best avoided. Before attempting to drain your pool yourself, you should contact a qualified pool service engineer and seek their advice. There are very few circumstances where it will be necessary for you to drain your pool, such as to dilute total dissolved solids (TDS) or to make a repair which cannot otherwise be performed. Should you still need to drain your pool, follow the advice of your pool engineer closely. Not all swimming pools are the same when it comes to draining them. The following recommendations are tips only – be sure to get the full procedure from your service engineer before attempting to do this yourself. Most in-ground residential swimming pools, and some above-ground pools, have a main drain. Where this is available you can use it to remove water from the pool. 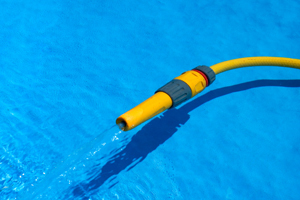 If the pool you are trying to empty does not have a main drain, you can use a submersible pump, pool pump, or trash pump, to drain the swimming pool. The trash pump, (designed to pump water containing solids such as leaves, twigs, sand and sludge) is one of the fastest methods to drain a swimming pool. Leaving in-ground, vinyl liner or fibreglass pools without water for an extended period of time, particularly in the heat, could cause them to collapse, shrink or crack. When necessary you should be able to use a trash pump, submersible pump or the bottom drain to drain this type of pool. The best method for draining an above-ground swimming pool is with a siphon, or a small to medium sized pump where no main drain is present. It may also be possible to drain with a swimming pool vacuum pump or a regular garden hose. Commonly these pools will have bottom or main drains. Gunite pools are made from cement with forms and when they are empty they are designed not to collapse. Use the on board filter system with the bottom drain. The pool should then be refilled as soon as possible. Before refilling your pool, make sure any valves that were opened to drain it are closed. Once the pool is full you can switch the pump and heater back on and start to add the necessary chemicals to balance the water. To find our more read our guide on pool chemicals. Wind, sun and heat can all cause major damage to your pool when it is empty of water. Seek the advice of a professional before draining your pool! To find a local pool service engineer you may want to use our directory, available via the links included at the top right of all pages of the site. Have you drained your pool before? Has your pool suffered damage from draining? What tips or tricks might you add to help anyone else draining their pool? Leave your comments in the box provided below.